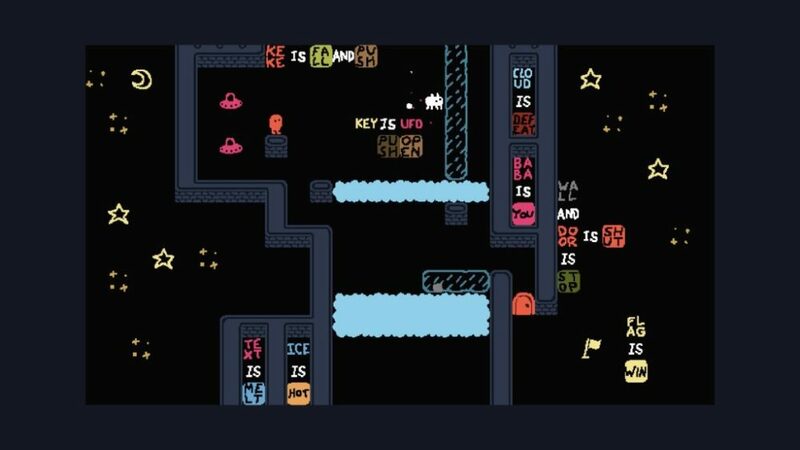 Baba Is You is full of tricky levels to complete, few as tough as the ninth in the Space section, which is called Platformer. Here’s everything you need to know about how to complete the Platformer Level in Baba Is You. First of all, push UFO to above OPEN, then push PUSH and KEY up so that KEY IS UFO is spelled above PUSH and OPEN. This will spawn the important second actual UFO where the key was. Next, push OPEN up and UFO across so that you have KEY IS OPEN and UFO IS PUSH in a cross shape. Next, to continue the Platformer Level, take the two actual UFOs and put them one above the other in the thin cloud space, below where OPEN currently is. Then, get KEY and push it onto the top of the actual UFOs, pushing it into the cloud area. Then, do the same thing with OPEN. Following this, push the two UFOs into the left two tiles in the purple hashed area. For the next part of the Platformer Level in Baba Is You, head back to the top of the screen and push OPEN so that it is up and left one place from the KEY that is in the cloud before making UFO IS PUSH to the right of the little block that your alien friend is standing on. Then, push your little mate onto the words, which will then let you push him along by moving UFO momentarily and pushing IS OPEN along until PUSH is above and left of OPEN. Alternatively, you could move UFO round to the right of PUSH and then push the guy along to the same place. Which you do is up to you, but you will need to rearrange UFO IS PUSH to push the little man off OPEN and onto KEY, at which point you’ll be able to push OPEN to send him down to the actual UFOs into the space below. For the next part of the Platformer Level in Baba Is You, push him along to the right most UFO and then push the UFOs so that he’s on one that’s on the far right end of that short purple area. You will then be able to push him onto the door to the right of that area. Then, head back to the top and rearrange everything so that PUSH is above where KEY is in the cloud area and so that KEKE IS OPEN is spelled vertically at the top. This will then make the door disappear, seeing your little friend go with it. You will now to able to go to the flag to complete the level. That’s everything you need to know about how to complete the Platformer Level in Baba Is You. For more tips and tricks on the game, be sure to search for Twinfinite. Is Cuphead Coming to Nintendo Switch?